BOND: 10 Things You Might Not Know About THE SPY WHO LOVED ME | Warped Factor - Words in the Key of Geek. Geek Dave keeps the British end up. 1. The Spy Who Loved Me was in many ways a pivotal film for the Bond franchise, and was plagued since its conception by many problems. The first being the departure of one half of the Bond production team, Harry Saltzman. Saltzman was forced to sell his half of the film franchise in 1975 for £20 million as he had branched out into several other unsuccessful ventures and consequently was struggling through personal financial reversals unrelated to Bond. 2. 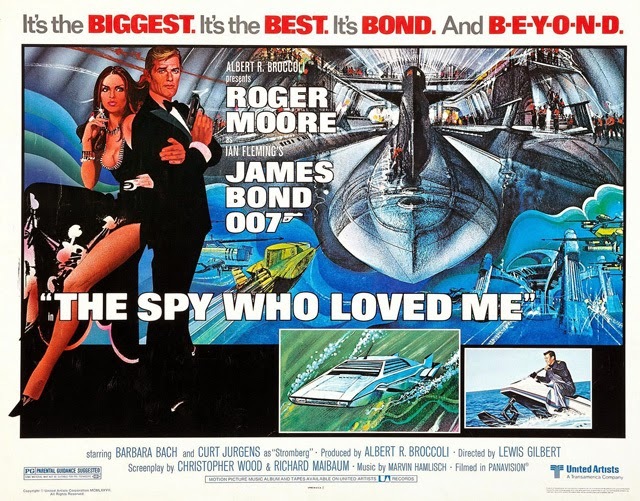 Although The Spy Who Loved Me takes its name from Ian Fleming's tenth book in the James Bond series, Eon Productions did not have the rights to use any of the plot elements in the actual novel itself, so Albert R Broccoli commissioned a number of writers to work on a script for the film, including Stirling Silliphant, John Landis, Ronald Hardy, Anthony Burgess, and Derek Marlowe. Even the British television producer Gerry Anderson provided a film treatment (although originally planned to be Moonraker) much similar to what ended up as The Spy Who Loved Me. Eventually, Richard Maibaum provided the screenplay, and at first he tried to incorporate ideas from all of the other writers into his script. Maibaum's original script featured an alliance of international terrorists attacking SPECTRE's headquarters and deposing Blofeld, before trying to destroy the world for themselves to make way for a New World Order. 3. In the years since Thunderball, Kevin McClory had set up two film companies and was trying to make a new Bond film in collaboration with Sean Connery and novelist Len Deighton - you can read more about that here. McClory got wind of Broccoli's plans to use SPECTRE, an organisation that had first been created by Fleming while working with McClory and Jack Whittingham on the very first attempt to film Thunderball, back even before it was a novel, in the late 1950s. McClory threatened to sue Broccoli for alleged copyright infringement, claiming that he had the sole right to include SPECTRE and its agents in all films. Not wishing to extend the already ongoing legal dispute that could have delayed the production of The Spy Who Loved Me, Broccoli requested Wood remove all references to Ernst Stavro Blofeld and SPECTRE from the script. Broccoli then bought in Tom Mankiewicz, who had worked on the three preceding Bond films, to do an extensive rewrite of the script. Mankiewicz says he did not receive credit, because Broccoli was limited to the number of non-English in key positions he could employ on the films in order to obtain Eady Levy assistance (Eady Levy was a tax on box office receipts in the United Kingdom phased out in 1985, that was intended to support the British film industry). 4. Although Fleming had requested that no elements from his original book be used, the novel features two thugs named Sol Horror and Sluggsy Morant. Horror is described as having steel-capped teeth, while Sluggsy had a clear bald head. These characters would be the basis for the characters of Jaws and Sandor, respectively. Also, since Ian Fleming permitted Eon to use only the name of his novel, Fleming's name was moved for the first time from above the film's title to above "James Bond 007" (you can see this in the poster at the top of the page). Fleming's name reverted to the traditional location for Moonraker, the last Eon Bond film based on a Fleming novel before 2006's Casino Royale. 5. Catherine Deneuve wanted to play the female lead of Anya Amasova so badly that she was willing to cut her normal rate from $400,000 per picture to $250,000. Negotiations continued almost up until filming, but Broccoli eventually insisted he would not pay her any more than $80,000 and Deneuve withdrew her name from contention. With just four days to go before The Spy Who Loved Me was set to go before the cameras, Barbara Bach was offered the chance to read for a role in the film. She believed the audition to be for a minor part and performed her screen-test accordingly, it was only after she was offered and accepted the role that she discovered she would be playing the main female protagonist. 6. The famous parachute ski jump stunt during the film's pre-title sequence was originally suggested by one-time Bond George Lazenby for On Her Majesty's Secret Service, but the necessary equipment to film it was not available then. It was something the Bond producers thought would've been a great idea, and had earmarked to use at the first possible opportunity. The Union Jack added in at Lewis Gilbert's request, to really signify the Britishness of Bond from right out the gate. "...never seen a reaction in the cinema as there was that night. You couldn't help it. You could not help but stand up. Even Prince Charles stood up." 7. By 1977 the James Bond franchise was the most lucrative movie franchise in the world, and many manufacturers wanted their products featured. With great competition between companies wanting to supply Bond's car, Don McLaughlin, PR Manager of Lotus, came up with an ingenious plan. He realised that the best way to win this coveted position was to make the film's producers chase after him, rather than going begging to them. One day McLaughlin turned up at Pinewood Studios driving a brand new unreleased Lotus Esprit, with all identifying names covered up. He parked it outside the Bond set, knowing that the producers would see it when they broke for lunch. Once the car had attracted a crowd, all clamouring to know what the car was, McLaughlin nonchalantly got in and drove away without answering any questions. As he had expected, the producers were desperate to discover what the car was and Broccoli was on the phone to strike a deal the very next day. After the film's release, demand for white Lotus Esprit cars surged to the point that new customers had to be placed on a three-year waiting list. As for the actual one featured in the movie it was purchased for £616,000 at a London auction in October 2013 by Elon Musk, who plans to rebuild the vehicle and attempt to make the fictional dual-purpose car be an actual dual-purpose car (good both underwater and on land). 8. You likely remember the famous scene where a man is drinking his wine as Bond's Lotus emerges from the beach, but you might not know that the man is actually the assistant director for the Italian location shoot, Victor Tourjansky. The scene became something of a Bond in-joke, and Tourjansky would return in similar appearances in another two Bond films shot in Italy, Moonraker and For Your Eyes Only. 9. Jaws actor Richard Kiel could only keep the metal teeth in his mouth for about half a minute at a time due to the excessive pain and discomfort they caused. He later revealed that he was often asked to show comic expressions which was quite contradictory to the way he was feeling wearing the extremely uncomfortable braces. Kiel had a stunt double, Martin Grace, but as the metal teeth had been designed for Kiel's mouth alone Grace had to make do with pieces of orange peel wrapped in tin foil! By the way, the chain that Jaws bites through was made of licorice. 10. The closing credits said "James Bond will return in For Your Eyes Only" but, because of the successes of Star Wars: Episode IV - A New Hope and Close Encounters of the Third Kind, the space themed Moonraker was chosen as the next Bond film to be produced. James Bond will return next Monday in 10 things you might not know about Moonraker.